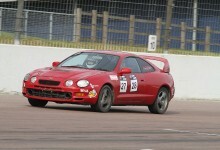 Rockingham is again the venue which starts the 2010 season. Once again, a course is constructed using the outer oval. An entry of Alfa Romeos for the Alfa Romeo Sprint Cup joins for their debut event.